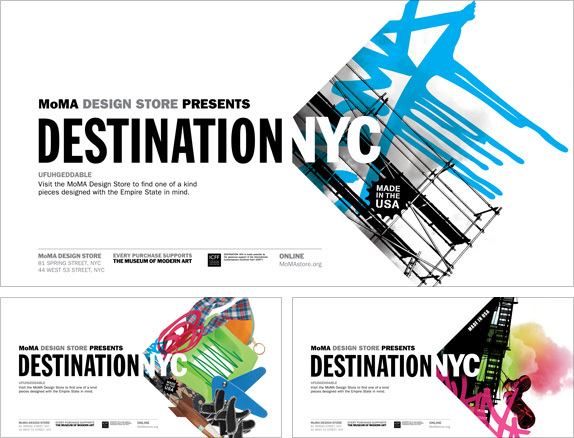 In 2005, the MoMA Design Store launched the first of its Destination: Design series that brings products from different cities and countries from around the world to the museum’s store. 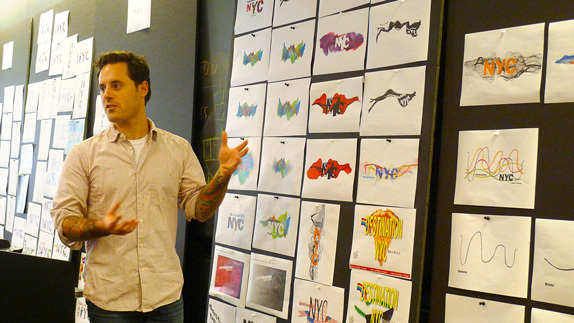 The project has a couple of benefits: a) more cool stuff to buy at MoMA and b) exposure for local artists who may not otherwise get a chance to sell their work at such large scale. So far, the series has brought products from Finland, Denmark, Buenos Aires, Berlin, Japan, Seoul, Brazil, Portugal, Istanbul, and Mexico. 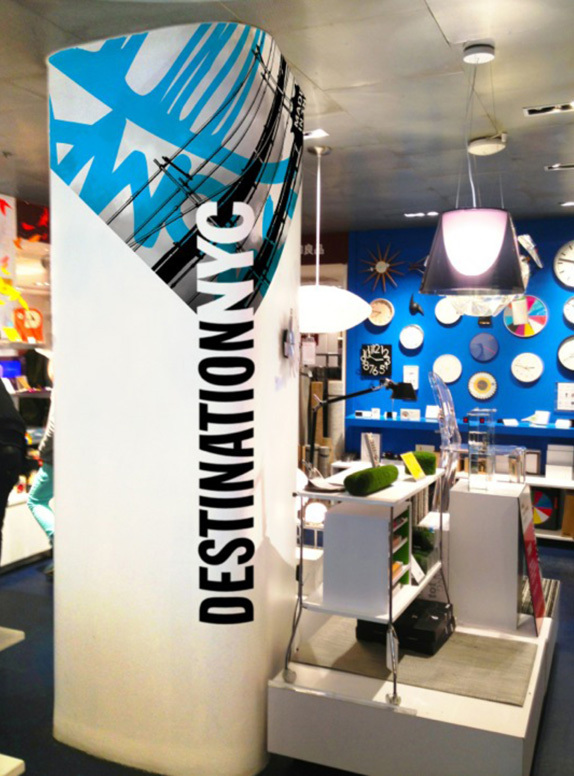 Its latest edition is Destination: NYC, a collection with approximately 200 lifestyle products including home accessories, furniture, paper goods and jewelry — all products are manufactured in the U.S.. Each edition in the series has had its own identity, sometimes designed in-house at MoMA, others in collaboration. 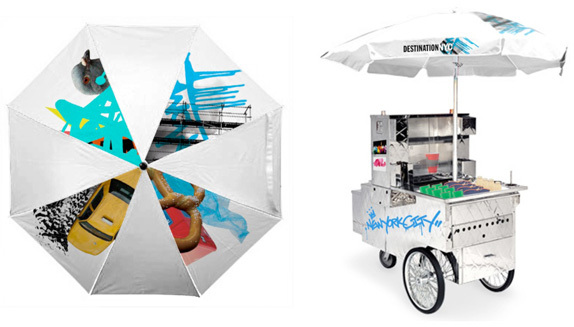 This one was designed with the School of Visual Arts Masters in Branding Program under the guidance of Mark Kingsley, who also wrote advertising headlines and copy, designed window and store displays (currently in progress) and product photography. 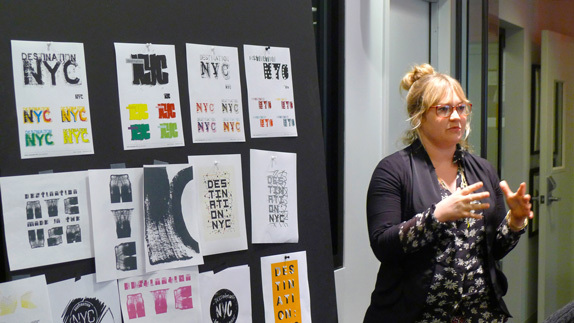 Destination NYC uses a flexible identity where disparate elements, from all corners of the world, collide, contrast and combine into a vibrant whole. 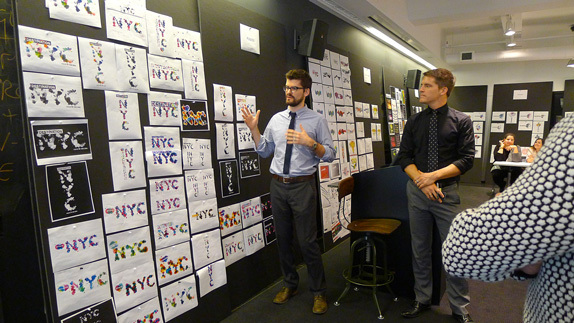 The holding shape suggests the everyday landmark of New York City: the corner. All version of the logo. Detail view of each “corner”. There is plenty of stuff to see, so I’ll state my peace early on. If there is one thing to say about this, it is that it feels like New York. It’s messy, it’s busy, it’s cacophonous, it’s a bunch of stuff piled on each other regardless of whether it’s cool (graffiti) or uncool (pigeon). The concept of putting it all in a “corner” is a great way to tie it all together. The logos have a great, raw energy to them that is then nicely tempered in application with more MoMA-esque approaches of simple typography and white backgrounds. Overall, the project is a fun, over-the-top answer to a somewhat ephemeral project that will live until the next Destination arrives. Video for display use at MoMA’s Soho store. 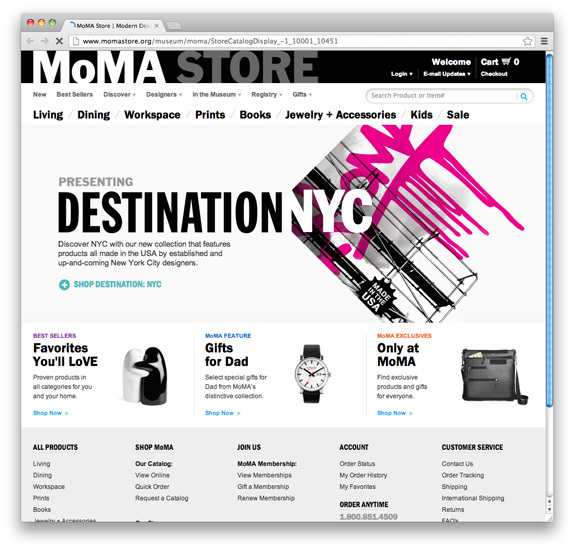 Video for display use at MoMA store, split across three screens. Process and presentation images. Click on each to view bigger. 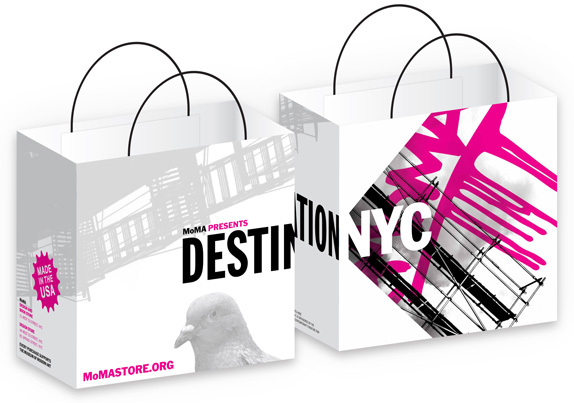 In 2005, the MoMA Design Store launched the first of its Destination: Design series that brings products from different cities and countries from around the world to the museum's store. 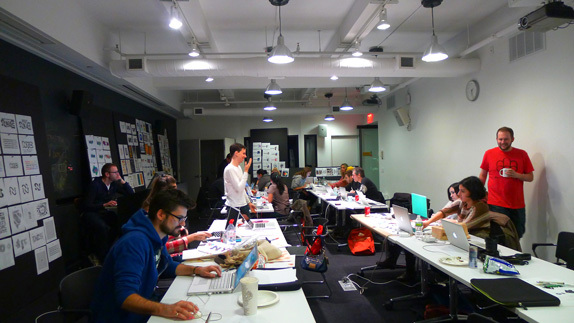 The project has a couple of benefits: a) more cool stuff to buy at MoMA and b) exposure for local artists who may not otherwise get a chance to sell their work at such large scale. So far, the series has brought products from Finland, Denmark, Buenos Aires, Berlin, Japan, Seoul, Brazil, Portugal, Istanbul, and Mexico. 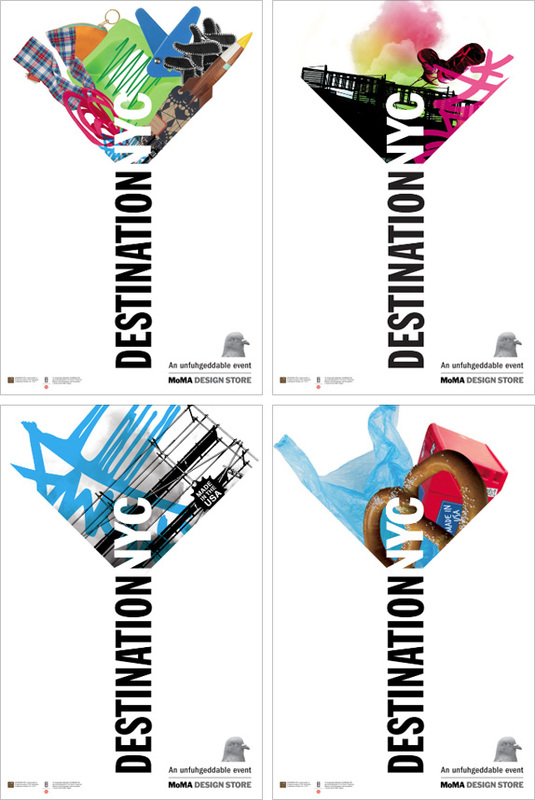 Its latest edition is Destination: NYC, a collection with approximately 200 lifestyle products including home accessories, furniture, paper goods and jewelry — all products are manufactured in the U.S.. Each edition in the series has had its own identity, sometimes designed in-house at MoMA, others in collaboration. 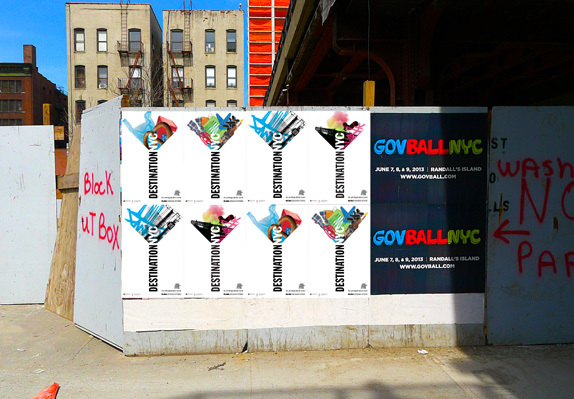 This one was designed with the School of Visual Arts Masters in Branding Program under the guidance of Mark Kingsley, who also wrote advertising headlines and copy, designed window and store displays (currently in progress) and product photography.